You’ve probably heard the old myth that eating too many eggs will contribute to high cholesterol and that you should limit your egg intake. One day the fitness industry exploded with this concept of eating egg whites, when fat and cholesterol found in yolks were portrayed as horrible things. Fat and cholesterol can be bad things. There are bad sources of both, but there are also healthy fats and good cholesterol that are essential to your health. LDL is bad cholesterol. Too much of this could cause plaque to build up in the arteries and could potentially cause a blockage leading to stroke or heart attack. The best way to avoid LDL is to stay away from processed food. HDL is good cholesterol. It actually helps protect the heart. A simple way to ensure you’re getting your daily intake is with a daily serving of raw nuts. When it comes to eggs, a substance in the yolk called lecithin may actually help increase HDL. Don’t ditch your yolks if you’re concerned about your health. As mentioned above, they will not lead to heart disease as they do they opposite. They also contain many nutrients. For starters, the yolk contains 90.5% of the egg’s calcium, 93.8% of it’s iron, and 99.8% of it’s zinc. Everyone’s concerned about calcium levels for bone health, many people (women most often) lack iron, and zinc is found in every tissue of the body so it is crucial for cellular health, not to mention it’s antioxidant qualities. Yolks contain 100% of the egg’s vitamin’s A, E, D, K, it’s DHA and AA, and it’s Carotenoids. Actually, eating too many egg whites can lead to biotin deficiency, so eat your yolks to obtain that water soluble B vitamin. Of course egg whites aren’t nutritionally useless, so eat whole eggs! The combination of the whites and yolks make for quite the nutrient dense food source. 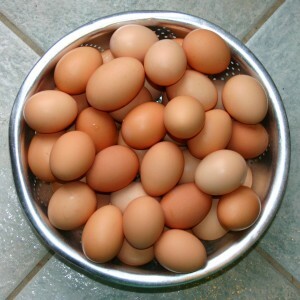 An egg contains 25 different nutrients, one of which being protein, at approximately 6 grams per egg. Gram per gram they are one of the best protein sources known to man. If you’re on a high protein diet, those 2 eggs breakfasts aren’t really going to cut it, or give you enough energy to sustain yourself for very long. Seeing that we have learned above that egg yolks are in fact a great source of vitamins and minerals, feel free to eat a few eggs to achieve the calorie and protein ratios needed for your size and goals. To put it in perspective for you, you would need to consume 4-5 eggs to get the same protein ratios that you would find in one chicken breast or one serving of fish. What about raw eggs? There are many benefits to consuming them raw. Both the yolk and whites help eliminate toxins in the body when consumed raw. When any animal protein is cooked it will change the structure of the proteins. Eggs are of course still healthy when cooked but by leaving them uncooked, all the nutrients and enzymes are left intact. Always be mindful of food quality, and purchase free range organic eggs whether you’re eating them raw or cooked. If you’re looking for advice on ways to prepare eggs, or how to go about consuming them raw, contact our nutritional department and have a chat with one of our nutritional trainers. Or pop by our front desk!